This article is about the hill in Ottawa. For other uses, see Parliament Hill (disambiguation). "Colline du Parlement" redirects here. For the one in Quebec City, see Parliament Hill (Quebec City). Parliament Hill (French: Colline du Parlement), colloquially known as The Hill, is an area of Crown land on the southern banks of the Ottawa River in downtown Ottawa, Ontario, Canada. Its Gothic revival suite of buildings is the home of the Parliament of Canada and has architectural elements of national symbolic importance. Parliament Hill attracts approximately 3 million visitors each year. Law enforcement on Parliament Hill and in the parliamentary precinct is the responsibility of the Parliamentary Protective Service (PPS). 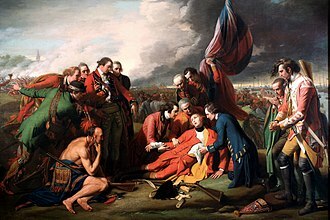 Originally the site of a military base in the 18th and early 19th centuries, development of the area into a governmental precinct began in 1859, after Queen Victoria chose Ottawa as the capital of the Province of Canada. Following a number of extensions to the parliament and departmental buildings and a fire in 1916 that destroyed the Centre Block, Parliament Hill took on its present form with the completion of the Peace Tower in 1927. Since 2002, an extensive $1 billion renovation and rehabilitation project has been underway throughout all of the precinct's buildings; work is not expected to be complete until after 2028. Parliament Hill is a limestone outcrop with a gently sloping top that was originally covered in primeval forest of beech and hemlock. 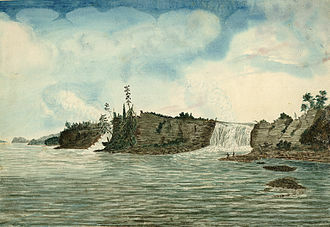 For hundreds of years, the hill served as a landmark on the Ottawa River for First Nations and, later, European traders, adventurers, and industrialists, to mark their journey to the interior of the continent. After Ottawa—then called Bytown—was founded, the builders of the Rideau Canal used the hill as a location for a military base, naming it Barrack Hill. A large fortress was planned for the site, but was never built, and by the mid 19th century the hill had lost its strategic importance. 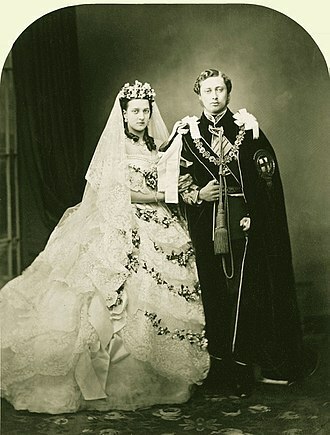 In 1858, Queen Victoria selected Ottawa as the capital of the Province of Canada, and Barrack Hill was chosen as the site for the new parliament buildings, given its prominence over both the town and the river, as well as the fact that it was already owned by the Crown. On 7 May, the Department of Public Works issued a call for design proposals for the new parliament buildings to be erected on Barrack Hill, which was answered with 298 submitted drawings. After the entries were narrowed down to three, Governor General Sir Edmund Walker Head was approached to break the stalemate, and the winners were announced on August 29, 1859. The Centre Block, departmental buildings, and a new residence for the governor general were each awarded separately, the team of Thomas Fuller and Chilion Jones, under the pseudonym of Semper Paratus, winning the prize for the first category with their Victorian High Gothic scheme of a formal, symmetrical front facing a quadrangle, and a more rustic, picturesque back facing the escarpment overlooking the Ottawa River. The team of Thomas Stent and Augustus Laver, under the pseudonym of Stat nomen in umbra, won the prize for the second category, which included the East and West Blocks. 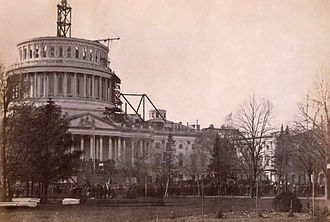 These proposals were selected for their sophisticated use of Gothic architecture, which was thought to remind people of parliamentary democracy's history, would contradict the republican Neoclassicism of the United States' capital, and would be suited to the rugged surroundings while also being stately. $300,000 was allocated for the main building, and $120,000 for each of the departmental buildings. Ground was broken on December 20, 1859, and the first stones laid on April 16 of the following year, and Prince Albert Edward, Prince of Wales (later King Edward VII), laid the cornerstone of the Centre Block on September 1. The construction of Parliament Hill became the largest project undertaken in North America to that date. However, workers hit bedrock earlier than expected, necessitating blasting in order to complete the foundations, which had also been altered by the architects in order to sit 5.25 metres (17 ft) deeper than originally planned. By early 1861, Public Works reported that $1,424,882.55 had been spent on the venture, leading to the site being closed in September and the unfinished structures covered in tarpaulins until 1863, when construction resumed following a commission of inquiry. Parliament Buildings, Ottawa, Ontario, c. 1866. 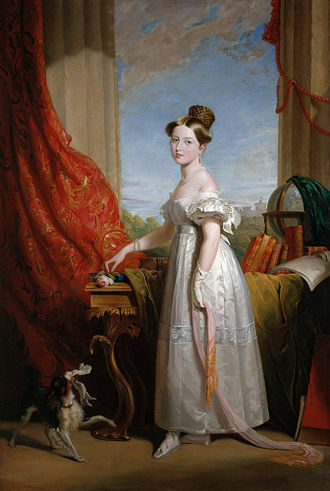 Two years later, the unfinished site hosted a celebration of Queen Victoria's birthday, further cementing the area's position as the central place for national outpouring. The site was still incomplete when three of the British North American colonies (now the provinces of Ontario, Quebec, Nova Scotia, and New Brunswick) entered Confederation in 1867, with Ottawa remaining the capital of the new country. 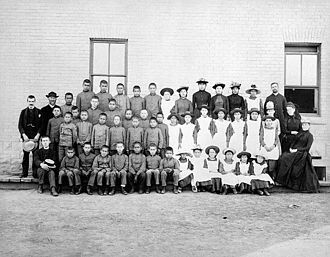 Within four years Manitoba, British Columbia, Prince Edward Island, and the North-West Territories (now Alberta, Saskatchewan, Yukon, Northwest Territories, and Nunavut) were added and, along with the associated bureaucracy, the first three required representation be added in parliament. Thus, the offices of parliament spread to buildings beyond Parliament Hill even at that early date. The British military gave a nine-pound naval cannon to the British army garrison stationed in Ottawa in 1854. It was purchased by the Canadian government in 1869 and fired on Parliament Hill for many years as the "Noonday Gun". By 1876, the structures of Parliament Hill were finished, along with the surrounding fence and gates. However, the grounds had yet to be properly designed; Governor General the Marquess of Dufferin and Ava sent chief architect Thomas Scott to New York City to meet with Calvert Vaux and view Central Park. Vaux completed a layout for the landscape of Parliament Hill, including the present day driveways, terraces, and main lawn, while Scott created the more informal grounds to the sides of and behind the buildings. 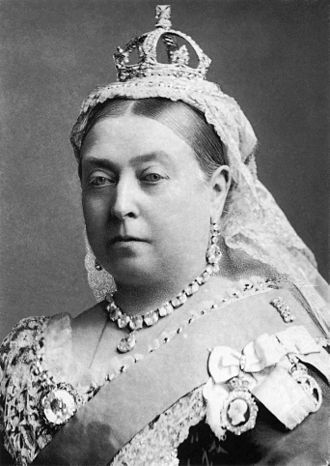 In 1901 they were the site of both mourning for, and celebration of, Queen Victoria, when the Queen's death was mourned in official ceremonies in January of that year, and when, in late September, Victoria's grandson, Prince George, Duke of Cornwall (later King George V), dedicated the large statue that stands on the hill in the late queen's honour. Fire destroyed the Centre Block on February 3, 1916. 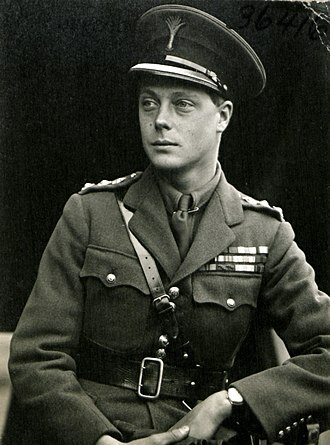 Despite the ongoing war, the original cornerstone was re-laid by Governor General Prince Arthur, Duke of Connaught, on September 1, 1916; exactly fifty-six years after his brother, the future King Edward VII, had first set it. Eleven years later, the new tower was completed and dedicated as the Peace Tower, in commemoration of the Canadians who had lost their lives during the First World War. Thereafter, The Hill hosted a number of significant events in Canadian history, including the first visit of the reigning Canadian sovereign—King George VI, with his consort, Queen Elizabeth—to his parliament, on May 19, 1939. VE Day was marked with a huge celebration on May 8, 1945, the first raising of the country's new national flag took place on February 15, 1965, the centennial of Confederation was celebrated on July 1, 1967, and the Silver Jubilee of Queen Elizabeth II was marked on October 18, 1977. The Queen was back on Parliament Hill on April 17, 1982, to issue a royal proclamation of the enactment of the Constitution Act that year. In April 1989, a Greyhound Lines bus with 11 passengers on board travelling to New York City from Montreal was hijacked by an armed man and driven onto the lawn in front of the Centre Block. A standoff with police ensued and lasted eight hours; though three shots were fired, there were no injuries. After a second incident in September 1996 where an individual forcibly drove his car into the Centre Block doors and proceeded to attack RCMP officers standing guard, it was decided in the interests of national security that Parliament Hill, which up to that time had been open to limited public traffic on the lower lawn, would be restricted to government and media vehicles only. Crowds marked the beginning of the third millennium with a large ceremony on the quadrangle and the "largest single vigil" ever seen in the nation's capital took place in 2001, when 100,000 people gathered on the main lawn to honour the victims of the September 11 attacks on the United States that year. The following year, Queen Elizabeth II's Golden Jubilee was marked on October 13, as was her Diamond Jubilee on February 6 (Accession Day) 2012. On October 22, 2014, several shooting incidents occurred around Parliament Hill. A gunman, after fatally shooting a Canadian Army soldier mounting the ceremonial guard at the National War Memorial, moved to the Centre Block of the parliament buildings. There, he was killed in a shootout with RCMP officers and the Sergeant-At-Arms, Kevin Vickers. The gunman also injured one House of Commons constable, who was shot in the foot. The 88,480 square metres (952,391 sq ft) area, maintained by the National Capital Commission, is named by the Parliament of Canada Act as Parliament Hill and defined as resting between the Ottawa River on the north, the Rideau Canal on the east, Wellington Street on the south, and a service road (Kent Street) near the Supreme Court on the west. The south front of the property is demarcated by a Victorian High Gothic wrought iron fence, named the Wellington Wall and in the centre of which, on axis with the Peace Tower to the north, sits the formal entrance to Parliament Hill: the Queen's Gates, forged by Ives & Co. of Montreal. At each southern corner of the quadrangle are also smaller gates for every-day access. The main outdoor area of The Hill is the quadrangle, formed by the arrangement of the parliament and departmental buildings on the site, and laid out in a formal garden fashion. This expanse is the site of major celebrations, demonstrations, and traditional shows, such as the changing of the guard, or the annual Canada Day celebrations. To the sides of the buildings, the grounds are set in the English garden style, dotted with statues, memorials, and, at the northwest corner, a Carpenter Gothic structure called the Summer Gazebo, a 1995 reconstruction of an earlier gazebo, Summer House, built for the Speaker of the House of Commons in 1877 by Thomas Seton Scott and demolished in 1956. Beyond the edges of these landscaped areas, the escarpment remains in its natural state. Though Parliament Hill remains the heart of the parliamentary precinct, expansion beyond the bounded area described above began in 1884, with the construction of the Langevin Block across Wellington Street. After land to the east, across the canal, was purchased by private interests (to build the Château Laurier hotel), growth of the parliamentary infrastructure moved westward along Wellington, with the erection in the 1930s of the Confederation and Justice Buildings on the north side, and then further construction to the south. By the 1970s, the Crown began purchasing other structures or leasing space deeper within the downtown, civic area of Ottawa. In 1973, the Crown expropriated the entire block between Wellington and Sparks Streets with the intent of constructing a south block for Parliament Hill. However, the government dropped this proposal and instead, constructed more office space in Hull, Quebec, such as the Terrasses de la Chaudière and Place du Portage. In 1976, the Parliament Buildings and the grounds of Parliament Hill were each designated as National Historic Sites of Canada, given their importance as the physical embodiment of the Canadian government and as the focal point of national celebrations. The Parliament of Canada Act renders it illegal for anyone to name any other area or establishment within the National Capital Region as Parliament Hill, as well as forbidding the production of merchandise with that name on it. Any violation of this law is punishable on summary conviction. The style of the Buildings is the Gothic of the 12th and 13th Centuries, with modifications to suit the climate of Canada. The ornamental work and the dressing round the windows are of Ohio sandstone. The plain surface is faced with a cream-coloured sandstone of the Potsdam formation, obtained from Nepean, a few miles from Ottawa. The spandrils [sic] of the arches, and the spaces between window-arches and the sills of the upper windows, are filled up with a quaint description of stonework, composed of stones of irregular size, shape and color [sic], very neatly set together. These with the Potsdam red sandstone employed in forming the arches over the windows, afford a pleasant variety of color [sic] and effect, and contrast with the general masses of light coloured sandstone, of which the body of the work is composed. The sculptural ornament is overseen by the Dominion Sculptor. 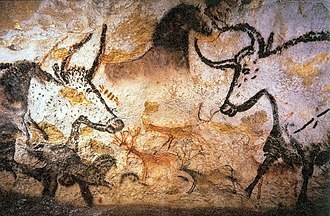 Five people have held the position since its creation in 1936: Cléophas Soucy (1936–50), William Oosterhoff (1949–62), Eleanor Milne (1962–93), Maurice Joanisse (1993–2006) and Phil R. White (2006–present). The only structure on Parliament Hill to have been purposefully demolished was the old Supreme Court building, which stood behind the West Block and housed the Supreme Court of Canada between 1889 and 1945. Throughout the 1950s and 1960s, there were proposals to demolish other parliamentary precinct buildings, including the Library of Parliament and West Block for new structures, and the East Block for parking, but none of these plans were adopted. Instead, renovations were undertaken to the East Block, beginning in 1966. In 2002, an extensive $1 billion renovation project began across the parliamentary precinct, specifically focusing on masonry restoration, asbestos removal, vehicle screening, parking, electrical and mechanical systems, and improved visitors' facilities. The Library of Parliament and Peace Tower, as well as some exterior areas of masonry on the Centre Block have so far been completed, though focus has shifted to the West Block due to its rapidly deteriorating cladding. In 2018, when the Centre Block is slated to be closed for ten years to carry out an extensive interior restoration and upgrade, the inner courtyard of the newly renovated West Block will be enclosed and fitted with a temporary chamber for the House of Commons while the Senate will be temporarily relocated down Wellington St. in The Government Conference Centre. Restoration of the East block is set to commence upon completion of Centre Block's restoration. Sir George-Étienne Cartier This was the first statue erected on Parliament Hill, to the immediate west of the Centre Block, at the instigation of Sir John A. Macdonald. 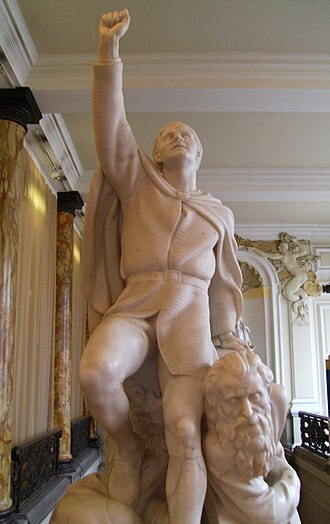 From amongst proposals from Canada, the United States, the United Kingdom, and Italy, Louis-Philippe Hébert was chosen to form the monument, which was set up in the 1880s. Sir John A. Macdonald Louis-Philippe Hébert was selected from 44 submissions from Canada, the United States, the United Kingdom, and Europe, to sculpt the statue of Canada's first prime minister. In the 1880s, it was unveiled at the south east corner of the Centre Block. Queen Victoria Located at the north-west corner between the West and Centre Blocks, the statue of the country's first monarch was sculpted by Louis-Philippe Hébert in 1900, and dedicated by Prince George, Duke of Cornwall and York, in 1901. Sir Galahad This is the only statue on Parliament Hill that is not of a monarch or politician, or within the site's fences. It was installed in 1905, at the initiative of the future prime minister William Lyon Mackenzie King, in order to honour the bravery of his friend Henry Albert Harper and is the work of Ernest Wise Keyser. D'Arcy McGee The competition for this sculpture took place simultaneously with that for the rendition of George Brown, and was won also by George William Hill. It was unveiled in 1913, at its location northwest of the Library of Parliament. This dual statue by Walter Seymour Allward has occupied the site at the northeast corner of the parliamentary precinct since 1914. Sir Wilfrid Laurier This work by Joseph-Émile Brunet was selected from 40 entries received from around the world and was placed at the southeast corner of the site in 1922. Sir Robert Borden Frances Loring cast this likeness for the 1957 session of parliament opened by Queen Elizabeth II; it stands at the southwest corner of Parliament Hill. William Lyon Mackenzie King This statue was commissioned for the Canadian Centennial in 1967, designed by Raoul Hunter, and stands at the northwest corner of the East Block. John Diefenbaker This statue was initiated by an Act of Parliament, and Leo Mol was chosen from 21 submissions to sculpt this 1985 work, which stands immediately north of the West Block. Queen Elizabeth II Situated in the opposite corner of the site from the statue of her great-great-grandmother, the monument was sculpted by Jack Harman and unveiled in 1992, in the presence of the Queen, as part of the 125th anniversary of Confederation celebrations. The Famous Five This monument was donated in 2000 to the Crown by the Famous 5 Foundation and is a collection of five individual statues, by Barbara Paterson, of each of The Famous Five—Emily Murphy, Irene Parlby, Nellie McClung, Louise McKinney, and Henrietta Edwards— as well as one empty chair. It is located at the east edge of the precinct, to the south of the statue of Queen Elizabeth II. Centennial Flame Lester B. Pearson dedicated this fountain and flame on January 1, 1967, to mark the beginning of the Canadian Centennial. Canadian Police Memorium This memorial was designed and constructed to honour Canadian police officers killed in the line of duty since 1879. Dedicated on March 22, 1994, the memorial has since been expanded to include the names of fallen officers from all law enforcement agencies, including the Ministry of Natural Resources, the Ministry of Fisheries and Oceans, and the Ministry of Conservation. War of 1812 Monument Seven figures—a First Nations individual, a Métis militiaman, a British infantryman, a Quebec Voltigeur, a woman bandaging one of them, a Royal Navy marine, a farmer—represent the War of 1812. Also part of the monument is a maple tree planted in soil taken from 10 Canadian battlefield sites and watered at the dedication with water from six oceans and lakes significant in the War of 1812. It was dedicated on November 6, 2014, the 200th anniversary of the war's final battle in Canada, the Battle of Malcolm's Mills. ^ Canadian Press (May 6, 2007). "Parliament Hill tourist facilities overwhelmed". CTV. Retrieved January 9, 2009. ^ "Follow the Rehabilitation of the Parliament Buildings". Public Services and Procurement Canada. Retrieved March 8, 2018. ^ a b c d e f g h Bosc, Marc; O'Brien, Audrey (2009). "The Parliament Buildings and Grounds". House of Commons Procedure and Practice (2 ed.). Ottawa: Queen's Printer for Canada. ISBN 978-2-89635-321-7. ^ Public Works and Government Services Canada (February 26, 2013). "Pre-construction, 1826-1858". Queen's Printer for Canada. Archived from the original on May 22, 2013. Retrieved May 10, 2013. ^ a b c d e f Public Works and Government Services Canada (March 27, 2013). "Building The Hill". Queen's Printer for Canada. Archived from the original on October 6, 2011. Retrieved May 10, 2013. 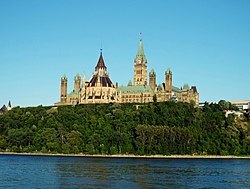 ^ "Ottawa Becomes Canada's Capital". City of Ottawa. Archived from the original on June 27, 2013. Retrieved May 10, 2013. ^ Department of National Defence. "Noonday Gun". Queen's Printer for Canada. Archived from the original on May 17, 2014. Retrieved May 16, 2014. ^ Hubbard, R.H. (1977). Rideau Hall. Montreal and London: McGill-Queen’s University Press. pp. 101–106. ISBN 0-7735-0310-2. ^ Public Works and Government Services Canada. "Peace Tower". Queen's Printer for Canada. Archived from the original on April 23, 2011. Retrieved January 9, 2009. ^ "Gunman Hijacks Greyhound Bus in Canada, Surrenders". Los Angeles Times. latimes.com. United Press International. April 8, 1989. Retrieved May 10, 2013. ^ "Interview With Pervez Musharraf; Interview With Paul Martin; Interview With Kweisi Mfume". CNN Late Edition with Wolf Blitzer. CNN. December 5, 2004. ^ Multiple. "Soldier fatally shot outside of Parliament, one gunman killed". The National Post. Retrieved October 22, 2014. 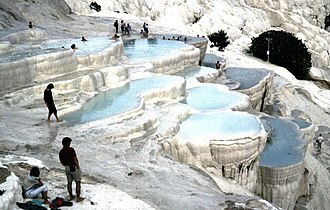 ^ "The Hill Grounds". Queen's Printer for Canada. Retrieved May 10, 2013. ^ "Parliament of Canada Act". 80.1. Ottawa: Queen's Printer for Canada (published July 9, 2007). 2007. Retrieved August 5, 2010. ^ House of Commons (October 22, 1999). "Building the Future" (PDF). Circulation. Ottawa: Queen's Printer for Canada: 54. Retrieved January 12, 2009. ^ Parliament Buildings. Canadian Register of Historic Places. Retrieved August 2, 2011. ; Public Grounds of the Parliament Buildings. Canadian Register of Historic Places. Retrieved August 2, 2011. ^ Nixon, Don (2012). The Other Side of the Hill. Lulu.com. pp. 83–84. ISBN 9781105408823. ^ Public Works and Government Services Canada (July 2012). "Dominion Sculptor Phil White receives Diamond Jubilee Medal". Queen's Printer for Canada. Retrieved May 10, 2013. ^ Public Works and Government Services Canada. "Reconstruction, 1916-1965". Queen's Printer for Canada. Retrieved May 10, 2013. ^ "Parliament Hill blocks need $1B facelift". Toronto Star. thestar.com. The Canadian Press. July 20, 2008. Retrieved May 10, 2013. ^ Koroluk, Korky (October 29, 2007). "Masonry deterioration sparks review of Parliament Hill's repair plans". Daily Commercial News. Retrieved May 10, 2013. ^ "Parliament Hill renovation costs climb past $1 billion". The Telegram. The Canadian Press. July 20, 2008. Retrieved May 10, 2013. ^ a b Public Works and Government Services Canada (September 6, 2018). "Follow the rehabilitation of the parliamentary buildings". Queen's Printer for Canada. Retrieved December 14, 2018. ^ Whyte, Murray (June 27, 2014). "Toronto sculptor Adrienne Alison creates monument to War of 1812". Toronto Star. Retrieved November 15, 2014. ^ "War of 1812 monument unveiled on Parliament Hill". Ottawa Citizen. November 7, 2014. Retrieved November 15, 2014. The United Province of Canada, or the Province of Canada, or the United Canadas was a British colony in North America from 1841 to 1867. 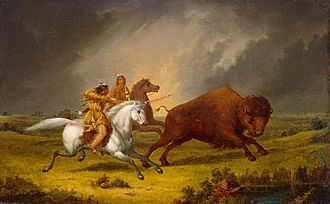 Its formation reflected recommendations made by John Lambton, 1st Earl of Durham in the Report on the Affairs of British North America following the Rebellions of 1837–38, in the aftermath of the Rebellions of 1837–1838, unification of the two Canadas was driven by two factors. Firstly, Upper Canada was near bankruptcy because it lacked stable tax revenues, and secondly, unification was an attempt to swamp the French vote by giving each of the former provinces the same number of parliamentary seats, despite the larger population of Lower Canada. 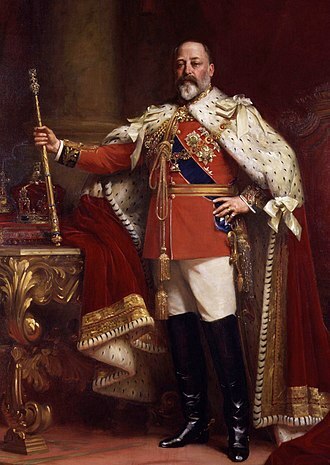 Although Durhams report had called for the Union of the Canadas and for Responsible Government, the new government was to be led by an appointed Governor General accountable only to the British Crown and the Kings Ministers. Responsible Government was not to be achieved until the second LaFontaine-Baldwin ministry in 1849, the Province of Canada ceased to exist at Canadian Confederation on July 1,1867, when it was redivided into the Canadian provinces of Ontario and Quebec. 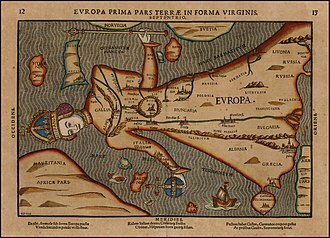 Upper Canada was primarily English-speaking, whereas Lower Canada was primarily French-speaking, the Province of Canada was divided into two parts, Canada East and Canada West. 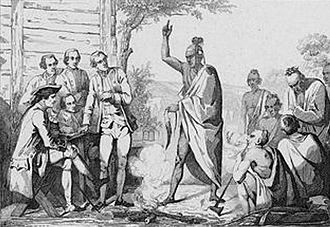 Canada East was what became of the colony of Lower Canada after being united into the Province of Canada. It became the province of Quebec after confederation, Canada West was what became of the former colony of Upper Canada after being united into the Province of Canada. It became the province of Ontario after confederation, the location of the capital city of the Province of Canada changed six times in its 26-year history. 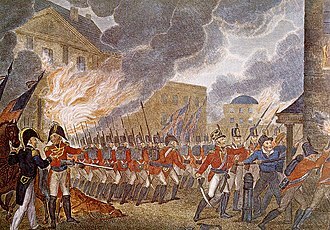 The first capital was in Kingston, the capital moved to Montreal until rioters, spurred by a series of incendiary articles published in The Gazette, protested the Rebellion Losses Bill and burned down Montreals parliament buildings. It moved to Quebec City from 1852 to 1856, Toronto for one year before returning to Quebec City from 1859-1866, in 1857, Queen Victoria chose Ottawa as the permanent capital of the Province of Canada, initiating construction of Canadas first parliament buildings, on Parliament Hill. 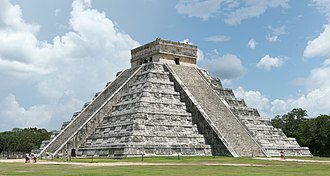 Thomas Fuller was a Canadian architect. From 1881 to 1896, he was Chief Dominion Architect for the Government of Canada, during which time he played a role in the design, Fuller was born in Bath, where he trained as an architect. Living in Bath and London he did a number of projects, in 1845 he left for Antigua, where he spent two years working on a new cathedral before emigrating to Canada in 1857. Settling in Toronto, he formed a partnership with Chilion Jones with Fuller responsible for design work, the company first won the contract to design the church of St. Stephen-in-the-Fields. 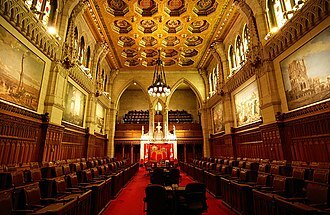 In 1859, The Legislative Assembly in Ottawa voted the sum of £75,000 for the erection of a Parliament House, the winning bid was made by Fuller and Jones for a neo-gothic design. The principal architects until its completion in 1866 were Thomas Fuller, in 1867 he won the contract to build the New York State Capitol building in Albany, New York, and spent the next several years in the United States. The project ran into severe cost overruns, and an inquiry blamed Fuller, Fuller thus returned to Canada, and unable to work in the more lucrative private sector, in 1881 became Chief Dominion Architect, replacing Thomas Seaton Scott. The West Block is one of the three buildings on Parliament Hill, in Ottawa, containing offices for parliamentarians, as well as some preserved pre-Confederation spaces. Built in the Victorian High Gothic style, the West Block has been extended twice since its completion in 1865. Though not as renowned as the Centre Block of parliament, the West Block appears on the obverse of the Canadian five-dollar bill, unlike the other buildings, however, it is not open for public tours. The West Block adds to the Ottawa skyline three prominent towers, the Mackenzie Tower, the Laurier Tower, and the Southwest Tower. After the entries were narrowed down to three, Governor General Sir Edmund Walker Head was approached to break the stalemate and the winner was announced on 29 August 1859, construction on all three blocks commenced by the end of 1859. 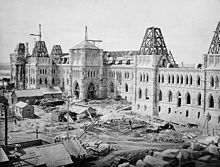 By the time the West Block was completed in 1865, the building was three years behind schedule, the first tenants were the offices of the postmaster general, the Ministry of Public Works, and the Crown lands departments. 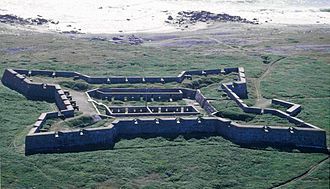 Calvert Vaux was a British-American architect and landscape designer. He is best known as the co-designer, along with his protégé and junior partner Frederick Law Olmsted, Vaux, on his own and in various partnerships and created dozens of parks across the country. He introduced new ideas about the significance of public parks in America during a time of urbanization. This industrialization of the cityscape inspired him to focus on an integration of buildings, bridges and he favored naturalistic and curvilinear lines in his designs, and his design statements contributed much to today’s landscape and architecture. 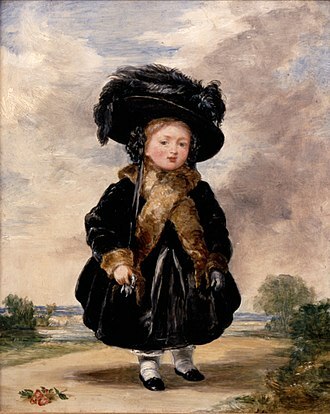 Little is known about Vauxs childhood and upbringing and he was born in London in 1824, and his father was a physician who provided a comfortable income for his family. Vaux attended a primary school until the age of nine. He trained as an apprentice under London architect Lewis Nockalls Cottingham, Vaux trained under Cottingham until the age of 26, becoming a skilled draftsman. Downing had traveled to London in search of an architect who would complement his vision of what a landscape should be. Downing believed that architecture should be integrated into the surrounding landscape. Vaux readily accepted the job and moved to the United States, Vaux worked with Downing for two years and became a partner in the firm. 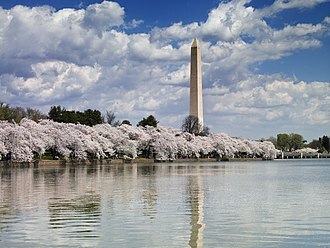 Together they designed many significant projects, such as the grounds in the White House, vaux’s work on the Smithsonian inspired him to write an 1852 article for The Horticulturalist, arguing that the government should recognize and support the arts. Shortly afterward, Downing died in a steamboat accident, in 1854, Vaux married Mary McEntee, of Kingston, New York, the sister of Jervis McEntee, a Hudson River School painter. They had two sons and two daughters, in 1856, he gained U. S. citizenship and became identified with the city’s artistic community, “the guild, ” joining the National Academy of Design, as well as the Century Club. 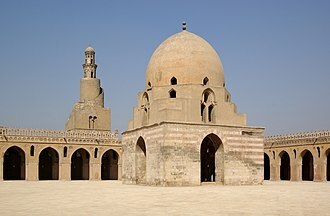 In 1857, he one of the founding members of the American Institute of Architects. Also in 1857, Vaux published Villas and Cottages, which was a pattern book that determined the standards for “Victorian Gothic” architecture. Old-growth features include diverse tree-related structures that provide diverse wildlife habitat that increases the biodiversity of the forested ecosystem. 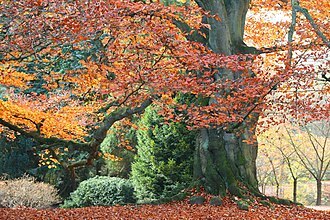 The concept of tree structure includes multi-layered canopies and canopy gaps, greatly varying tree heights and diameters. Old-growth forests are valuable, and logging of these forests has been a point of contention between the logging industry and environmentalists. 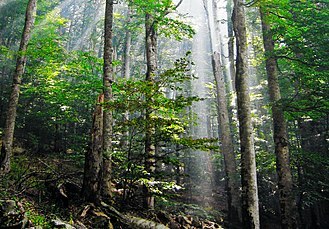 Old-growth forests tend to have trees and standing dead trees, multi-layered canopies with gaps that result from the deaths of individual trees. Depending on the forest, this may take anywhere from a century to several millennia, hardwood forests of the eastern United States can develop old-growth characteristics in one or two generations of trees, or 150–500 years. In British Columbia, old growth is defined as 120 to 140 years of age in the interior of the province where fire is a frequent and natural occurrence. In British Columbia’s coastal rainforests, old growth is defined as more than 250 years. In Australia, eucalypt trees rarely exceed 350 years of age due to frequent fire disturbance, Forest types have very different development patterns, natural disturbances and appearances. Levels of biodiversity may be higher or lower in old-growth forests compared to that in second-growth forests, depending on circumstances, environmental variables. Logging in old-growth forests is an issue in many parts of the world. Excessive logging reduces biodiversity, affecting not only the old-growth forest itself, a forest in old-growth stage has a mix of tree ages, due to a distinct regeneration pattern for this stage. 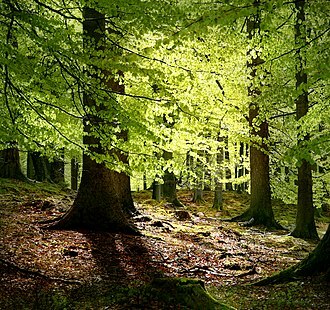 New trees regenerate at different times from other, because each one of them has different spatial location relative to the main canopy. The mixed age of the forest is an important criterion in ensuring that the forest is a stable ecosystem in the long term. A climax stand that is uniformly aged becomes senescent and degrades within a relatively short time-period to result in a new cycle of forest succession, uniformly aged stands are a less stable ecosystem. Wellington Street is a major street in Ottawa, notable for being one of the first two streets laid out in Bytown in 1826, but because of the adjacent Parliamentary Precinct. 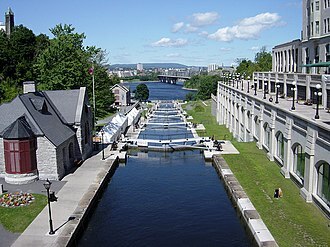 The street runs from Booth Street to the Rideau Canal where it connects with Rideau Street and it is named after the Duke of Wellington, in recognition of his role in the creation of the Rideau Canal, and therefore of Ottawa. Starting at its easternmost point, Wellington forms the edge of Confederation Square. West of the intersection with Bank Street, are located the Confederation Building, beyond Parliament Hill, the Supreme Court of Canada is situated west of the Justice building, and opposite St. Andrews Presbyterian Church. The East and West Memorial Buildings can be next, respectively standing east and west of Lyon Street. West of the Supreme Court is the National Library and Archives of Canada main building, between the Supreme Court and the National Library is a large open area that is today a mix of park land and large parking lots. Notre-Dame de Montréal, one of Canada's first major Gothic Revival structure. 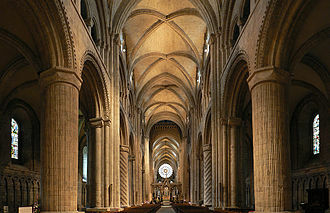 Its symmetry and straight lines still evoke the previous Georgian and neo-classical styles.